PROG: 81 – What Happened in Tunguska? Shock: As the craft emerges the test pilots sense something is wrong, the craft is shaking violently and the warp has begun to change them, turning them inside out. They realise they have been turned into anti-matter versions of themselves and seconds later their time-machine crashes into Tunguska, causing the famed explosion. Thoughts: Not only one of the oddest titled Future Shocks but one of the strangest executed. Over three pages we get the initial page taking all it’s five panels to show the 1908 explosion, a second page where the Mission Chief repeats the exact same historical facts about Tunguska to the test pilots and then one page where the time machine malfunctions and the crash happens. Certainly there is one page too many and the repetition of the various theories about Tunguska strongly suggests that Tharg guessed not only did the young readers not know what actually happened in Tunguska but that they’d never heard of the mysterious explosion in the first place. The script is incredibly dull, a surprise for Lowder who had always focused on humour, and Pierre Frisano isn’t really given much to draw: a mysterious explosion (which has to be devoid of elements that give the shock away) a page of talking heads and then one page where the pilots get ‘reversed’ and crash. With his 50’s Sci-Fi style it is all very retro and a tad staid but does what is asked of it well enough and this saves the Future Shock from being a real stinker. Indeed the shock itself isn’t bad – making the investigation into what happened the cause of what happened, and the combination of the two alternative theories into the shock is well thought out. However getting there has been so dull and exposition heavy that it is a shame it couldn’t have been wrapped up in a more dynamic tale. This was to be Frisano’s last work for 2000AD and Lowder’s last Future Shock, although he was to pen a great many Time Twisters in the future. Shock’d? : The shock itself is nicely executed, combining the competing theories of what caused the Tunguska explosion is cleverly done and the until the craft malfunctions there certainly could have been anything awaiting the test pilots on the final page. A strange combination of the shock element working while the preceding script itself didn’t. PROG: 78 – Nothing On Earth! Plot: At the American Space Research Centre, Houston, Professor Weems and his team identify a UFO heading for earth. Mobilizing the military, under the command of no-nonsense General B. Buckner Bulspitt, the military and the scientists rush to the landing site. The alien craft drops its ramp and out slither small many-eyed, multi-tentacled aliens. So repulsed is Gen. Bulspitt that he orders his weapons to open fire and the aliens are swiftly destroyed. Almost immediately a different alien craft arrives and this time tall bear-like creatures lollop forth. Weems and Bulspitt regard them as much friendlier looking and engage them in dialogue. The aliens ask what happened the previous spaceship which they identify as belonging to the ‘Sloog’ race. Shock: The new aliens laugh at the Sloog’s destruction, and, as they open fire, they inform the General that the Sloog were peaceful and no-doubt intending to warn Earth about their own arrival, because the second aliens are ‘space pirates and planet destroyers‘. The General and Professor are slain in a hail of laser-fire. Thoughts: An odd Shock that seems to rely on a central premise, that mankind will automatically kill any ‘ugly’ aliens’, that doesn’t really hold much water. Chris Lowder, whose two previous Shocks have been played for laughs, enjoys himself with ridiculous character names and a over-the-top Yankee accent for the General but there is an absence of any actual humour in the plot. This results in his scripting coming across as rather contemptuous of the audience and the genre, as if saying he knows the story is cliché hack-work but here it is anyway. Given his central premise is somewhat odd he might have concentrated on rationalizing it away a tad better than ‘bampot General thinks you’re ugly so die’. In addition it’s not exactly clear why a seven-foot tall brown bear in a spacesuit is automatically cuddly and friendly. 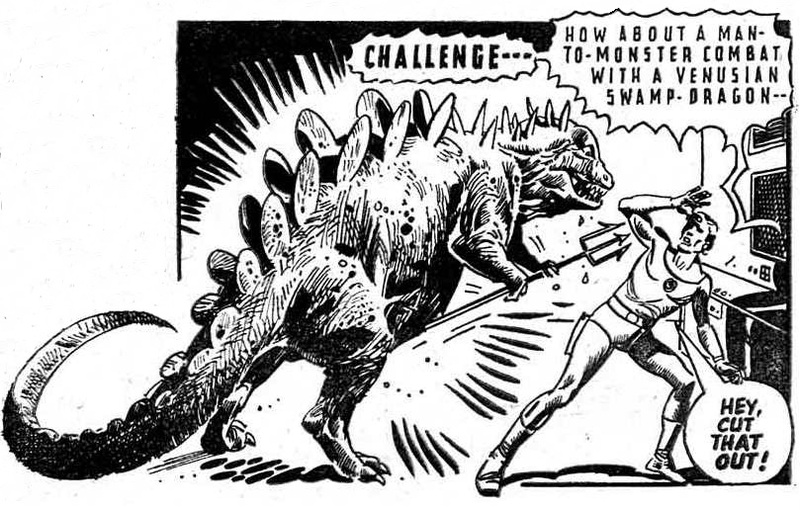 Sure children have stuffed bears as toys but by the time they get to reading 2000AD many of them will have stored such away and be more likely to know that Bears are gert big killers like Sharko. This problem, along with oddities such as the American Space Research Centre not actually having a plan for alien contact, makes the whole script seem lazy even if there is, as no doubt Lowder took, pleasure in the silly names etc. 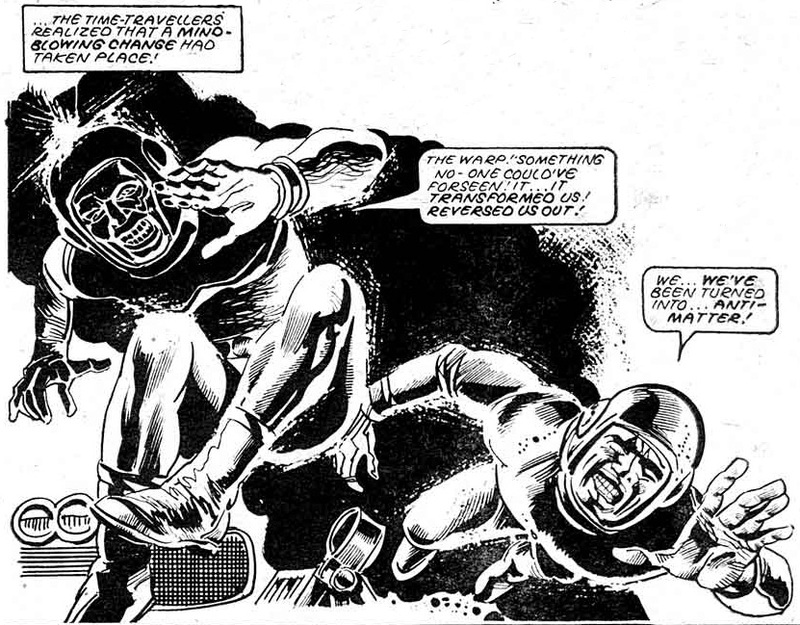 The art by Frisano is professional but again slightly hampered by his 1950’s stylings and the strip, printed in the era of Star Wars, is all very B&W B-movie in tone. The result is a lesser Shock from two talented creators. Shock’d? : The Bears’ sudden turn to violence isn’t telegraphed but nor is it very connected; the Major’s decision to shoot the Sloog is so random that after that juncture the story falls apart and any shock is more of a ‘oh well’. To buy into the ending being a shock the reader would have to have been enamoured with the ‘cuddly toy’ nature of the Bear aliens and it seems highly unlikely that readers of Judge Dredd and Robo-Hunter, both in this Prog, would still be at that level. Shock: Suddenly the Aliens depart and Packer finds himself confronted by huge talking apes who are clearly intent on hunting him. He realises he has been brought for their sport not the other way around. Thoughts: A beginning, of Pierre Frisano’s short five issue stint on Future Shocks, and an end, of Robert Flynn’s time writing for 2000AD, marked by a very ordinary story which rehashes the theme of ‘Man does X on earth, Aliens do X to man’. With FS 2, Trawling, it was eating / being eaten, in with FS 26, Space Bug, it was mining a body to a husk and now it’s the not very original ‘Hunter becomes the Hunted‘, agonizingly with that very cliché included in the final dialogue box. Flynn’s previous Shocks had always avoided this more obvious of devices and, while often containing logical flaws, did have merit for trying to create dynamic stories. Here he produces the most trite of Shocks but manages to write a contained and flowing tale. It might not be original but it is polished. 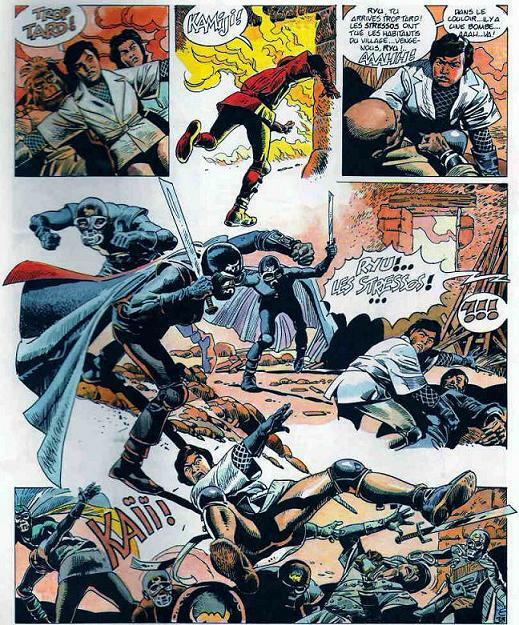 The real beauty of the strip is from the rare English-language appearance of French post-war artist Pierre Frisano, a name few would associate with 2000AD. Initially a cover illustrator, Frisano was constantly employed in one country, France, rather than being primarily associated with the UK, such as fellow Continentals Ezquerra and Belardinelli, or working throughout the continent, such as Caasanovas. Responsible for popular Sci-fi series San Ku Kai, and Courtesans, as well as several Opera translations, his B&W ink-work is highly formalist but with beautiful detail, the tighter early style of Colin Wilson is an obvious reference in the main character illustrated above; while his colour work, with a populist tendency to buxom women, has clear parallels with modern master John Burns’ wash and ink work. 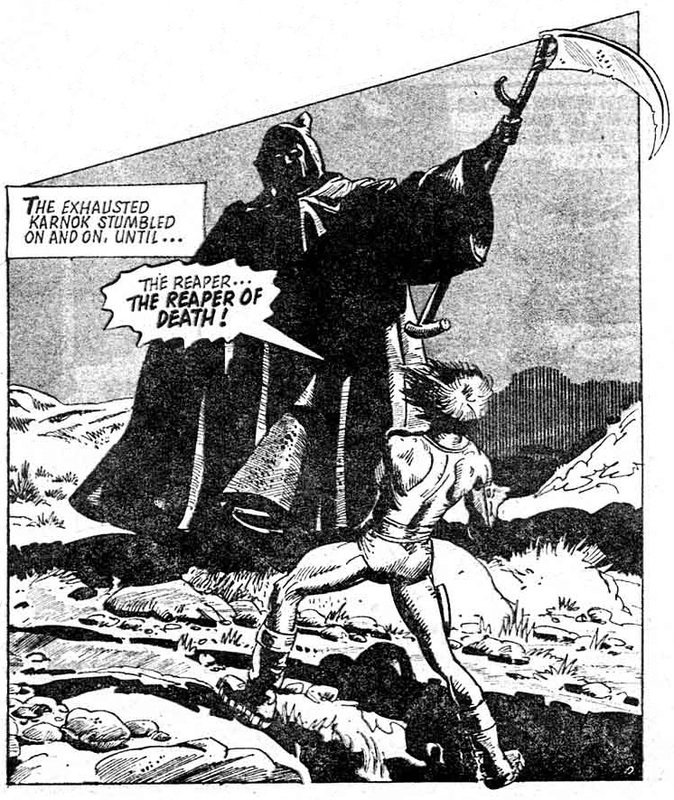 The five Future Shocks over the next few Progs, alongside a prior episode of MACH 1, was to be his only work for 2000AD as his French career boomed over the 1980s. As with many artists of a slightly older generation his Sci-Fi stylings are very 1950s orientated whereas his strength was in historical fantasy art, Dante would have been the perfect outing for his talents. 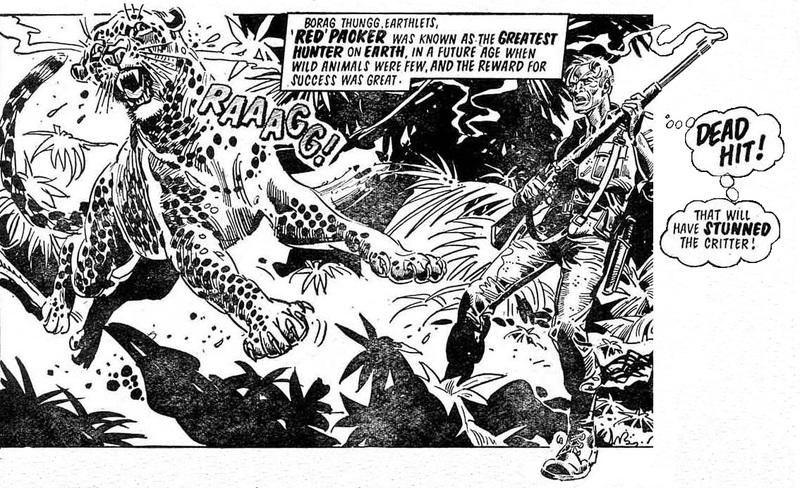 Sadly no-longer with us it is a nice part of 2000AD‘s heritage that he contributed these fine pages. Shock’d? : A bit of a damp squib after an effective build-up and marred by the terrible ‘Hunter becomes the Hunted’ line that should be barred from any genre fiction. Packer’s landing on the alien planet could have led to several different shock endings so that it is this very traditional reversal-of-fortunes ending is a disappointment.